Derived from the peels of sun-ripened oranges, caraway seed, and coriander, this orange bitters mixture adds a subtle spicy flavor and aroma to your crowed-pleasing cocktails and mixed drinks! The name Angostura comes from the town of Angostrua, Venezuela where the flavoring was first produced. This botanically-infused alcoholic mixture includes water, 28% alcohol, herbs and spices. This petite 4 oz. bottle of bitters can be used for multiple cocktails since it is to be ingested in small amounts as a flavoring. The herbal essences of Angostura orange bitters are well-suited for vodka, gin, and whiskey, and for adding a depth of flavor to rum cocktails. Serve an Old Fashioned classic cocktail at your bar, restaurant, or lounge made with whiskey, bitters, sugar, and water. Orange bitters' complex flavor makes it ideal for culinary use as well, particularly in savory sauces, seafood dishes, soups and gravies. It's also a natural accompaniment to chocolate and best matched with desserts such as fudge, jams/jellies, and ice cream. This 4 oz. bottle of Angostura bitters features a distinctive over-sized label for easy identification. Known to enhance the flavor of ingredients without masking their true flavor, bitters are also known as a restorative concentrate that may help ease an upset stomach. 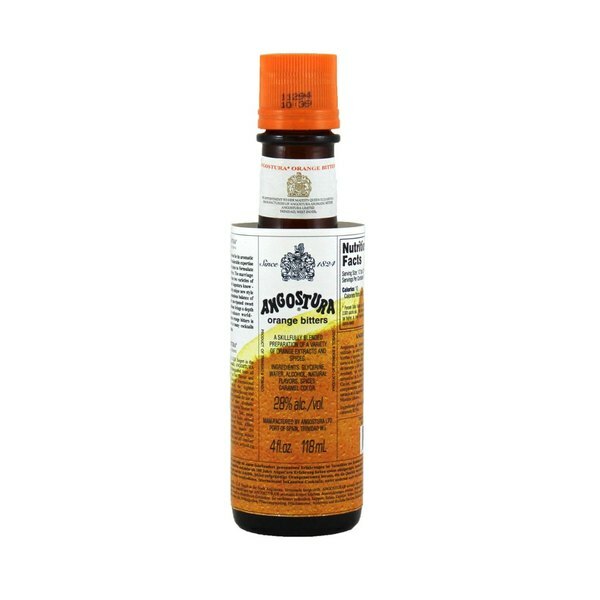 Certain classic cocktails and mixed drinks just won't taste the same without Angostura orange bitters! Angostura bitters is a really good brand. We use their bitters in a lot of our drinks. The orange bitters is nice is you want that extra flavor. Exactly as described! Angostura is a great brand of bitters. These are my favorite bitters for adding a special extra flavor to my mixed drinks. High quality bitters with a strong taste of orange peel with some additional subtle herbs and spices. It certainly adds complexity to any drink (try in a dry martini) and one little bottle goes a long way. A great classic bitters. Tastes of orange peel and botanicals. A bit difficult to find, this is a great value and ships without breakage. Get some! This is a great price with fast shipping for a good brand of bitters. The orange bitters work better in vodka and gin drinks. A little goes a long way. These are hard to find in some areas, and if you do find them, they can be pricey. These are great quality bitters, for a fraction of the price of usual vendors! Exactly as I expected it to be. Shipped correctly and less expensive yet more convenient than even ordering it from my grocery store. Exactly why I shop here. YUM! We love putting orange bitters in an old fashioned! (Some of us love bitters in about anything but...). The price and quality can't be beat! This orange bitters, by Angostura is one of the best!! Blends easily and brings just a touch of flavor to cocktails and salad dressing. We will be ordering soon. These are super high quality bitters. If you are using anything else to make your old fashioned then you are doing it wrong. Great subtle orange flavor! In my opinion these are the best bitters for cocktails. What a great surprise to find this product at webstauraunt. Great price. Bar supply charge more per bottle. Angostura is a well known brand for a reason. I have tried many of the boutique brands but keep coming back to Angostura. I use the lemon and the orange in a broad range of marinades and cocktails. I love the small size that does not take up a lot of space. We branched out to different varieties of bitters and this one is a great addition to drinks. Looking forward to making more cocktails with this. Finding these bitters here was such a great accident! Nobody carries them cheaper than webstaurant. Such a great product at a great price, you can't beat that! These bitters are great in cocktails but we use them in some of our specially made latte syrups and our customers love them! Angostura makes the best orange bitters! Do yourself a favor and use this product in food also; it is delicious with sautéed shrimp or scallops! Great price for this product! Had an old fashion cocktail made with orange bitters at a bar and wanted to recreate it at home. The orange bitters at the liquor store was double the price. Makes a great cocktail, and you don't need much of this stuff so it goes a long way. Highly recommend! This is same bitters they sell in the liquor store so if your placing an order you may as well pick up a bottle or two, its priced to sell. This is a decent orange bitter but I would more highly recommend the Regan's Orange Bitters for a deeper, richer flavor. However, for the price, you can't beat this option. Angostura Orange Bitter is very good in cocktail Screwdriver. You need: - 50 ml of citrus vodka - 75 ml of freshly squeezed orange juice; - 10 ml of sugar syrup; - 1 dash (1.25 ml) of Orange Bitter. Also Orange Bitter is the best for summer cocktails like Moskow Mule or Daiquiri.5Angostura Orange Bitter is very good in cocktail Screwdriver. You need: - 50 ml of citrus vodka (in my case Absolut Citron); - 75 ml of freshly squeezed orange juice; - 10 ml of sugar syrup; - 1 dash (1.25 ml) of Angostura Orange Bitter. Also Angostura Orange Bitter is the best for summer cocktails like Moskow Mule or Daiquiri. Orange bitters is great for making Old Fashioned's and other classic cocktails. This is perfect for our bar and will go a long way. Will be purchasing again. I prefer using orange or other citrus bitters over traditional flavors. It works great in old fashioned's and other cocktails where you want to increase the notes of citrus. A must have for every home bar! Love the flavor the orange gives and it's different than their normal bitters, which is also a must have. Since I'm not a cocktail enthusiast, I knew what Angostura Orange bitters is, and that is all. But when I found it here, its price per bottle was unavoidable. I bought a few more bottles to give to my friends, all of them really appreciate my present. Angostura orange bitters is an excellent product. I keep this on hand at my home bar and it adds a wonderful accent to many different cocktails! !